I am in LOVE with Ethel. 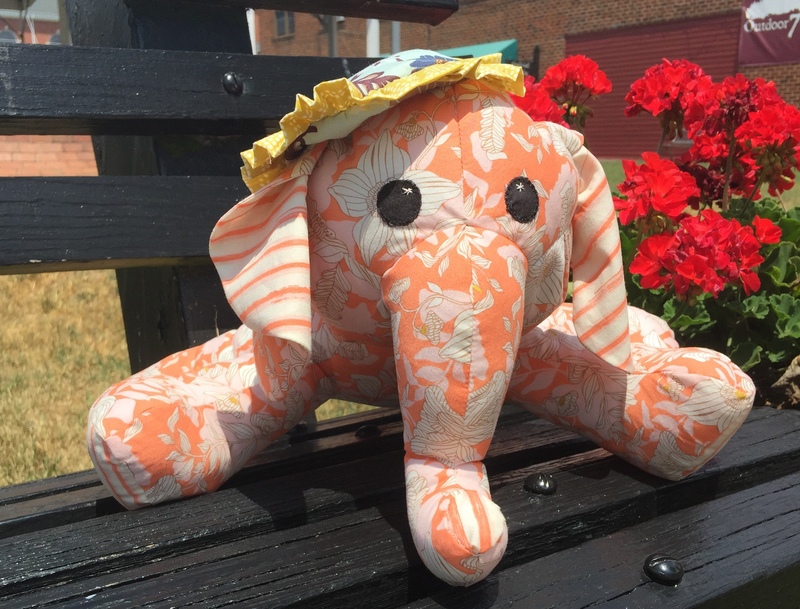 Not only is she made with beautiful Art Gallery fabric, but she is soft, cuddly, and so freaking adorable. Art Gallery is sponsoring a contest using the new Cultivate line by Bonnie Christine. This great line blends the cool colors of summer with warm fall tones. The challenge was to use any of the prints from this line to make anything that signifies change. We had just 2 1/2 weeks to make and submit a project for this challenge. That’s not much time, but doable. I was hoping to create my own pattern, but then I had the grand-monkeys for a week, and was sick for a week. So really, I didn’t have much time as originally expected to work on this challenge. But I love how she turned out. I used a Huggable Pattern for the elephant. I made up the hat and rocker, and honeyman made the rocker for me. She had her first photo shoot at the LQS, but when I took her to the park, her personality really came through. She decided that she really liked to garden among the hosta plants. And took a break on a bench in town square. If you have enjoyed Ethel, she asks that you log into Pinterest and VOTE FOR HER here. You vote by clicking on the heart on her picture. Of course, repins are great too. Can I Get a Whoop Whoop at Confessions of a Fabric Addict. 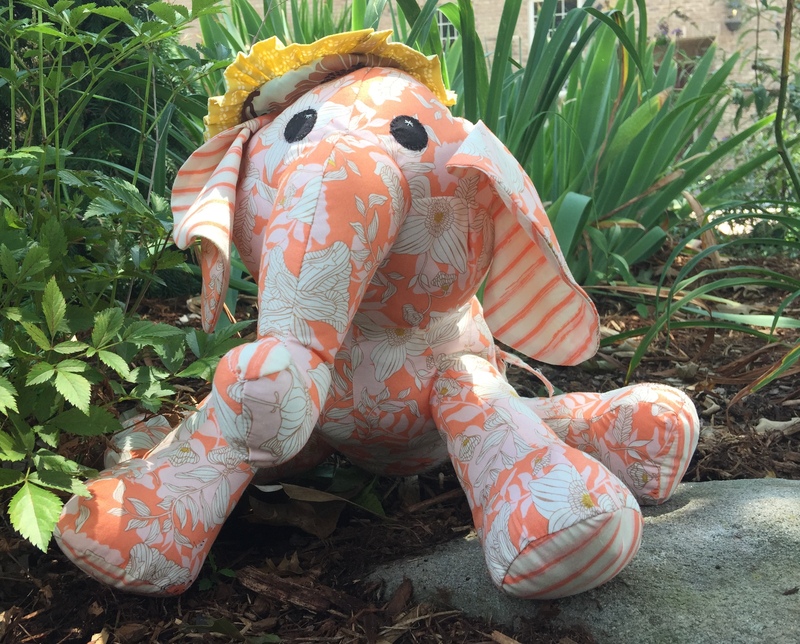 This entry was posted in Uncategorized and tagged agf, art gallery, Cultivate, Cultivate Challenge, Cultivate in Fall, elephant, plush by monkeyneedle. Bookmark the permalink. Adorable! I did vote for her, actually. Thanks so much! I do love her. And thanks for the vote! Oh my goodness…..This is just way to darn cute! Your face on the elephant is adorable! Thanks Audrey. She is pretty special. Ethel is so adorable with her little hat! That removable rocker is a great idea. She is too stinkin’ cute (as my friend would say)! Love how she wanted to frolic in the flora ! She loved playing in the gardens. Thanks for visiting. She is very cute! And wonderfully orange! This is so very cute. I love Ethel among the green hostas. Thank you. Her personality really came out when I took her to the gardens. The orange and the green really complemented each other. This is really sweet! And I agree about the orange and green. Ethel looks right at home in the hostas. She really loved the hostas. Thanks for visiting! 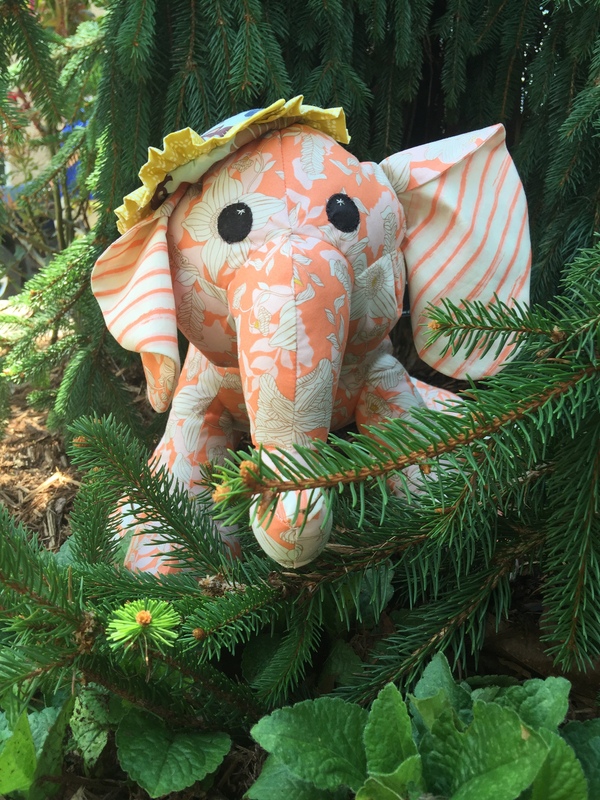 Ethel is certainly sweet… I have a special place in my heart for elephants! What an adorable little elephant! She is very elegant, for sure!! She’s freakin’ adorable! Love, love, love! Good luck! 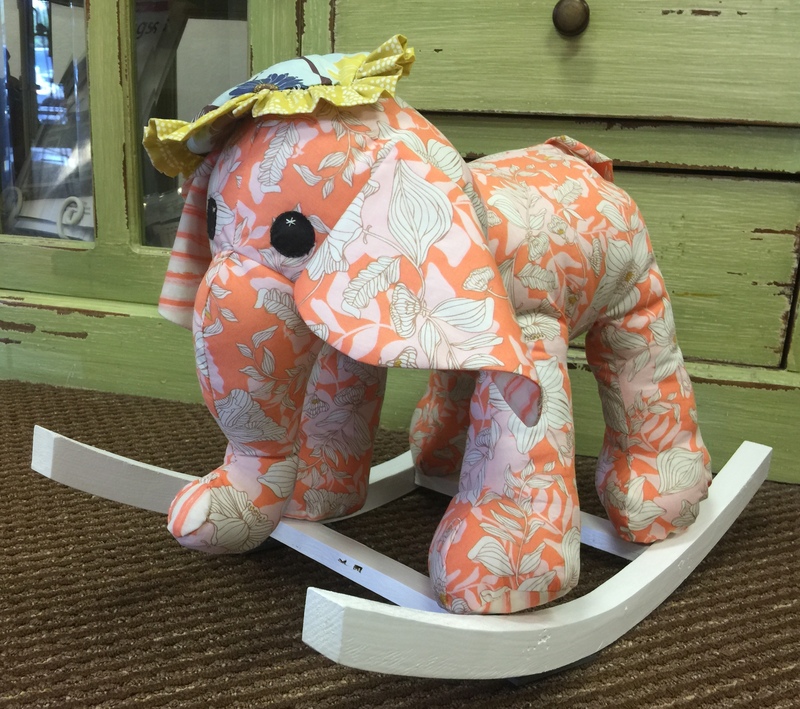 Oh, the adventures of Ethel the rocking elephant. I so enjoyed the story of her first outing…I think she should go on more tours and see what trouble she can get into. Good luck in the contest! 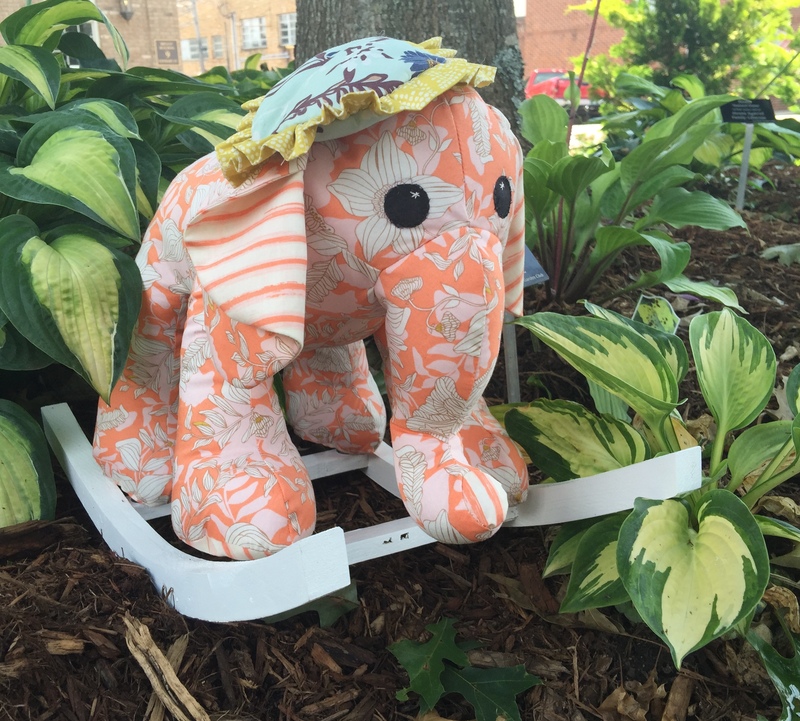 Visiting from Freemotion by the River, I just couldn’t resist coming by to see your adorable elephant. Too cute, great project. Thank you Carole. She’s even cuter in person. Thanks for visiting. Ethel is such a beauty! And so photogenic!! She made me smile with her hat!! Great job. So glad she made you smile. Thanks for visiting!